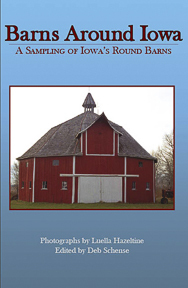 This title features more than one hundred of the round and multi-sided historic barns in Iowa. Luella Hazeltine, when she retired from Quaker Oats, took a copy of the State Historical Society of Iowa’s out-of-print book, Without Right Angles: The Round Barns of Iowa by Lowell Soike, and started visiting and photographing those barns. She would spend a decade documenting barns, and some of the barns she photographed have since burned or collapsed. Iowa at one time had more than two hundred thousand barns; less than sixty thousand remain, with approximately one thousand disappearing each year. This volume preserves some of that agricultural heritage. Also, Hazeltine’s color photographs are being preserved at the State Historical Society of Iowa.